Share the post "A Tale of Two Georges"
Credit this to being a (relatively) new dad: I find that I increasingly judge people by how good they are with kids. It first struck me while walking our neighborhood with my son and our dog around Christmas. He (the kid, not the dog) was so thrilled to see festive lights on nearly every house, that when we came to a few isolated houses that had nothing up, he was clearly confused and disappointed. Before he came along, I wouldn’t have thought twice about this. With him, I wanted to ask, What’s wrong with you people? Where are your pretty lights for my son to enjoy? For years I’ve been mildly resentful of George Takei, though I only realized last night it’s rooted in how he responds — or at least, responded once — to a little kid. I was 6, maybe 7, and attending my first sci-fi convention in the mid 70’s. I loved Star Trek with a wild passion (this was pre-Star Wars) and for some reason I especially liked George Takei’s character, Enterprise helmsman Hikaru Sulu. George Takei was at this particular convention, and I got a decent seat in the hall where he was speaking. I was thrilled beyond belief. I also wanted to make my own movies. I wouldn’t get my first Super-8 camera for a few more years, but I was already planning. One thing I really wanted to know — from George Takei, specifically — was how the special effect for the transporter was pulled off. He always had the best look on his face while being transported: ready, slightly wild-eyed with expectation and excitement. I knew he was an actor, but his enthusiasm was convincing. Surely he would know how the special effects guys did it. Surely he would help me understand so that I could incorporate the effect into my own movies someday. The entire hall erupted in laughter. I sank back into my seat, stunned. Good one, George. You successfully shot down a 6-year old kid and got hundreds of people to laugh in the process. Thank you. I wanted to clarify my question, but the laughter went on too long and I knew I wasn’t going to get an answer. Compare this to my next meeting with a famous George. George Lucas. About five years after the Takei take-down, I was walking down Woodland Avenue in San Anselmo, California, with two of my friend-girls (at ten or eleven, it was safer to call them “friend-girls” than “girlfriends.”) At the end of this street, on the corner of San Anselmo Avenue, sat a plain, white stucco, two-storey building, featuring only the small, meaningless placard, “Sprocket Systems,” in one window. Now, it was rumored that Sprocket Systems was actually a cover name for the sound effects division of Lucasfilm. In early 1980, I dumpster-dived there and snagged some embryonic Empire Strikes Back film prints containing pre-special effects shots of Mark Hamill sitting in his Rebel Snowspeeder, confirming the rumor for myself. For some reason, as Courtney, Dana, and I walked down Woodland in the summer of 1980, our conversation turned to what kind of car George Lucas was rumored to drive. “A chocolate-brown Ferrari,” Courtney insisted. Amazingly, as we cleared the last hedge separating the last house on the street from the parking lot (and the sweet, tempting dumpster) of Sprocket Systems, there, in the third parking space from the left, sat a dark brown Ferrari 308 GTS. With the top off. And five cans of 35mm film sitting on the passenger seat. “A CHOCOLATE BROWN FERRARI!” we screamed in unison. Oh my God. It was true. It was real. It was here. It was a Ferrari, and it belonged to George Lucas. We sat down on the curb at the bank across the street, and waited for I don’t know how long. At one point, I crossed the street and actually touched George Lucas’ chocolate-brown Ferrari, just to feel more connected to the man who’d given me the greatest, most dazzling thing in my life to that point. Even better than Star Trek, with its dated transporter special effect and TV-grade actors. 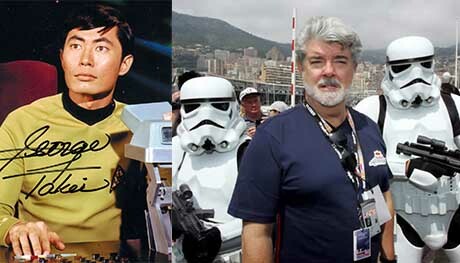 Finally, from that back door at the top of the stairs, George Lucas emerged. He was wearing a red, white, and blue plaid shirt, dark blue Levi’s jeans, and thick, black-framed glasses. He spotted us instantly — probably already knew we were there, molesting his car — yet he proceeded down the stairs without apparent fear or disgust of obvious children. That’s when we charged him. “Are you G-G-G-George Lucas?” I asked, breathlessly. “Yes, I am,” he said, smiling. We talked briefly, about how much we loved Star Wars and The Empire Strikes Back, and what was this new movie, Raiders of the Lost Ark, going to be about? Having caught him, we then released him. He drove away, still smiling and waving at us. Many people, including me, give George Lucas a hard time over the Star Wars prequels. They missed the mark, but I think Lucas’ heart was in the right place. He was making it for the next generation of kids, and he tried as hard as he could to make it as dazzling and fun for them as the original trilogy was for my generation. Besides, not every movie is going to be The Empire Strikes Back. George Lucas, you’re a good man. George Lucas loves kids. George Takei doesn’t, or at least, didn’t seem to that one afternoon. That doesn’t necessarily make George Takei a bad person, but it does make him a bad person with kids. In my newfound perspective as the official dad of an official kid, that makes him… well, kind of a bad person. George Takei, you’re kind of a jerk. © Kennedy Brandt 2015. All Rights Reserved.